PSLA has a rich history of dedicated active members who have volunteered their time as board members and committee chairs. Taking on one of these positions is a selfless act in which fulfilling association business and representing the members of the association is of great importance. Read the Learning & Media 15th Anniversary Edition which is filled with memories of the past. Millersville State Teachers College and Kutztown State Teachers College started holding library conference. Shippensburg state library conference – Celeste DiCarlo Nalwasky made the motion to form a separate organization which was passed by a large vote. Gwendolyn Brown was elected interim president. Dr. Frances Henne of Columbia University, speaker at the 1972 state conference, donated speaker honorarium to the new independent group to start their treasury. The first PSEA Round Table that concerned school libraries in Pennsylvania was held in 1917 according to available records. Millersville State Teachers College, Kutztown State Teachers College (1940s), Clarion State College (1950s) and Shippensburg State College (1960s) began hosting library conferences for school librarians. As early as 1963, John Rowell, the newly appointed state school library supervisor began requesting that the association become independent. Exploration of becoming a separate association continued to be explored until 1972. In April 1972, at the Shippensburg State College spring conference, the Pennsylvania School Librarians Association Section voted to become an independent organization. The new PSLA was dedicated to “improvement of the status and standards of school library media services in Pennsylvania” (Hoffman, 1988). Pending ratification of the constitution, an ad hoc committee was formed with the following officers: Gwendolyn Brown, President; Jack Luskay, Vice-president; Dorothy Lawley, Secretary-Treasurer; Marion Saul, Membership Chairman. Alice Bartz and Elizabeth Hoffman were named advisory consultants. Other members were invited to committee meetings as needed. Gwendolyn Brown is known as the “founding mother” of PSLA. The constitution was presented to members at the Spring Conference held at Shippensburg State College, April 27-28, 1973. This was the last conference that the four state colleges planned and henceforth was the responsibility of PSLA. 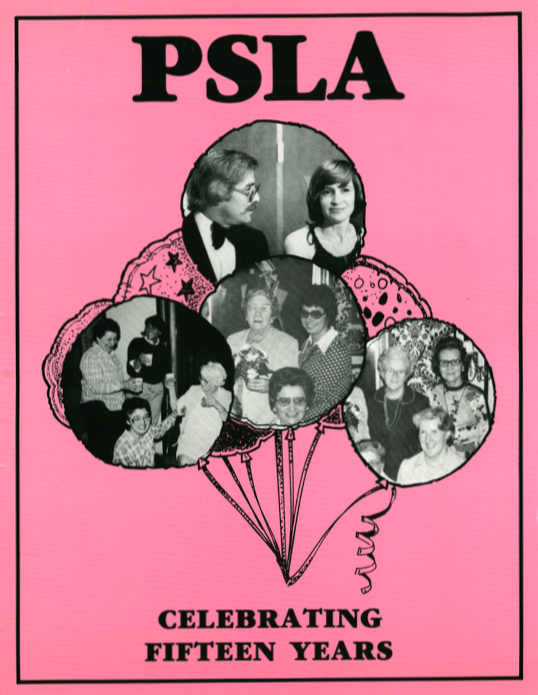 The first annual PSLA conference was held April 19-20, 1974 at the Host Inn in Harrisburg, PA. Over 230 school districts were represented with 682 attendees. During the 1974 conference, the major topic of the business meeting was, “The Report of the Citizen’s Commission on Basic Education.” This report supported cooperative programming between school and public libraries including the sharing of facilities and the use of paraprofessionals and support staff in school libraries during non-instructional time. At the business meeting, PSLA adopted their constitution as well as a resolution opposing the commission’s proposals. At the end of the meeting, PSLA was officially activated as an organization. In 1974, Jack Luskay became the first elected President of the Pennsylvania School Librarians Association to almost 1,000 members by 1975. School librarians “were asked to ‘Speak With One Voice’” (Hoffman, 1988). During his presidency PSLA promoted the new AASL-AECT National Standards, a new dues structure as implemented, a legislative network was started and 027.8 began publication. Hoffman, Elizabeth P. “Memories of Celebrations Past.” Learning and Media, vol. 16, no. 1, Winter 1988, pp. 10-25. *based on the minutes of the Board of Directors meeting in April or May of the year cited. The Pennsylvania School Librarians Association Annual Conference began in 1974 in Harrisburg, Pennsylvania.